The only things that I collected when I started traveling with my family were photos and shells. I always thought that these were enough when it came to documenting the places that we visited. But when I started traveling on my own, I was eventually drawn to the little yet valuable things that I encountered along the way. From then on, I knew that I had to take home a piece from every destination that I've been to. 1 - When I visited Hong Kong for the first time, my Kuya and I had a personal encounter with a Monk. Although there was a language barrier, he still managed to offer us a green Buddha bead bracelet in exchange for some money. He said it was for good luck. We obliged anyway. The slipper keychain with the strawberry print was also a memento from one of my summer trip's to the Summer Capital of the Philippines --- Baguio. It was the first time that I've ever seen the Strawberry Farm in La Trinidad, Benguet. Although I didn't get to pick any strawberries then (since it was raining hard), the fields still looked very beautiful. The dreamcatcher on the other hand was something that I purchased in Puerto Princesa, Palawan. I've managed to keep it attached on top of my double-deck bed until I transferred it to my shelf. For some reason, the bad dreams stopped coming when I placed it away from my head! :P Weird, right? 2 - I'm sure you've taken home a few rocks, shells and pebbles from some of your beach trips because I sure did. I actually placed all of my lovely picks inside a glass jar. I just stopped collecting when I could no longer fit any new ones inside it. Anyway, these small tokens from the sea came from the shores of Zambales, Batangas, Boracay, Bohol, Coron, Puerto Galera, Camiguin and Guimaras. Now, other than my collection of photos (a framed photo of me and my friend in Pattaya, Thailand AND me and Rubel inside the Merlion's mouth in Singapore), I also bought keychains from a few Southeast Asian destinations. I got a bunch of them while in Bangkok, Thailand and Ho Chi Minh, Vietnam. 3 - I also got a bunch of keychains and pins before I decided to get a uniformed set of travel souvenirs (my Starbucks City Mugs). The photo on the left holds my CWC Button Pin (when I first tried Wakeboarding in Pili, Camarines Sur), my starfish keychain from Puerto Princesa, my Merlion keychain from Singapore, and a pair of "Barn" printed trinkets from Bohol Bee Farm. 4 - The photo on the right displays two of my most cherished necklaces. The one with the Tarsier pendant was a remembrance from Bohol. It was also my first time to step foot on the province, so it was very memorable. The Pucca necklace on the other hand came from Boracay. It was a wedding souvenir from my friend who got married on the island last December 12, 2012. 5 - I also tried to be on the extreme side of things (to my level of extreme at least), and was able to go for Cebu's famous Sky Experience Adventure. The Skywalk Extreme and the Edge Coaster ride was one excruciating journey for someone like me who has a fear of heights! But since I got through that, I then encouraged myself to try Asia's longest dual zipline in Bukidnon. Thus the photo with the foggy background. I also got myself miniature replicas of the Bangui Windmills in Ilocos Norte, a Santo Niño from Cebu, a Coke bottle from Boracay, and some ceramic high heels from Marikina. I also kept the key to our room back in Puerto Pension, Puerto Princesa, which I forgot to surrender (Oppps!). 6 - It was only in 2010 when I started my Starbucks City Mug collection. I was able to buy my first pair when I visited Jeonju, South Korea. I was actually lucky because Jeonju only had one Starbucks store around, and it was just a few minutes away from our hotel. I bought most of these mugs during my travels. But a few of these were also given as gifts from family and friends (like LA, NYC, Orlando, Dubai, Bali, Davao, Bacolod and Kuala Lumpur, Malaysia --- which I'll be heading to this November!). How about you? What do you usually collect from your wayfaring adventures? ang coool! :D I collect random stuff lng eh. kahit anik anik lng haha! i wanted din sana a starbucks tumbler collection.. pero di carry.. hehehe..
your collection is great! hope i could do travel like you do too! nakaka inggit! Nice collection of Starbucks tumbler. 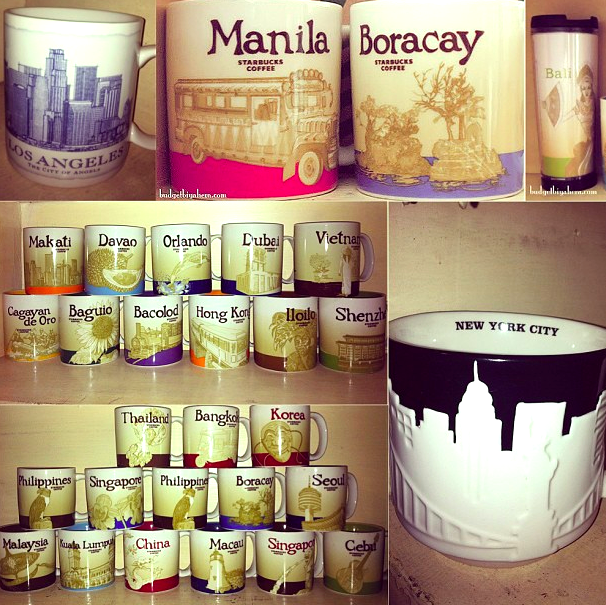 Those tumblers may cost much but matters not, since they are good souvenirs to keep to reminisce such great travels. anak, if ever makapag-travel, I'll be collecting caps. You have a nice collection sis and I'm sure each one of them has a story to tell. Take care always! I think I may have collected everything already from key chains to magnets to caps to figurines to shirts and of course, my latest obsession, Starbucks mug. I'm not very sentimental, I quickly loose interest in things that I wont or dont use..
And that includes souvenirs, probably the reason why I stick with collecting printed Sandos that I can buy from souvenir shops everywhere. I can wear them when I visit the gym or go running in BGC on my spare time. It's really depending on oneself, after all, I think you are more organise with your things and I'm just slothing most of the time. Thank you sis! Do you collect stuff too?